The Ebac Amazon Dehumidifier series includes two models, the Ebac Amazon 12 and the Amazon 15. This series is designed for smaller homes and is the least expensive dehumidifier in the Ebac range. This review focuses on the Ebac Amazon 15. The Amazon 12 is identical in every respect except extraction capacity and a single fan speed. The Amazon 12 extracts 12 litres per day (32C / 90% RH), sufficient for a two bedroom house (120 m2), whereas the Amazon 15 is designed for homes up to three bedrooms (150 m2), with an extraction rate of 15 litres per day. Ebac is known for high manufacturing standards, the reliability of its dehumidifiers and the technical innovations it has introduced to improve their performance, especially energy efficiency. The Ebac Amazon 15 benefits from Ebac's high manufacturing quality but is a "basic" machine, by the company's standards, lacking the refinements of more expensive models in the Ebac range, in exchange for a lower price. In particular it is not equipped with "SMART Control™", "intelligent defrost" or electronic controls. On the other hand, despite its lower price it does come with an adjustable humidistat, not always found on other manufacturers "budget" models. The importance of a humidistat is that it enables the user to pre-set a level of relative humidity which she or he wants to achieve. Once that level is reached the machine stops working and will only restart when the RH moves above that pre-set level. This feature is a major money saver. It also prevents the machine removing too much moisture from the air which can be just as unwelcome as having air that is too humid. The absence of electronic controls is a small price to pay for a lower initial outlay and "intelligent defrost is a luxury you need not pay for unless you want to use a dehumidifier in a cooler area than your main living rooms. Let's look at that point in a little more detail. Like most domestic dehumidifiers the Ebac Amazon dehumidifier works using the refrigerant process. Put simply, this passes air from the room over refrigeration coils, like those in your fridge. The water in the air condenses on the coils, water drips off the coils into the water container and the dry air goes back into the room. In all dehumidifiers of this type water will freeze on the coils, stopping the dehumidifier, if the temperature of the room is too low, below about 15C or 60F. This is not a problem, so long as you want the dehumidifier for use solely for use in the house, where the temperature is usually at or above that level. If, however, you think you might want to use a dehumidifier somewhere else, a garage, basement/cellar or conservatory, where the temperature may often fall below this level it would indeed be a problem. The bottom line is that for home use, in the living areas of the house, the Ebac Amazon dehumidifier is an ideal choice for a two (Amazon 12) or three (Amazon 15) bedroom house. If that's where you intend to use it why pay for something you don't need? "SMART Control™" is something else. "SMART Control™" is a trade-marked invention from Ebac that "remembers" the pattern of higher and lower humidity in your home yesterday and operates at the times it then "expects" higher humidity today. This is an energy saver. "SMART Control™" is not installed in the Ebac Amazon dehumidifier. This means that to achieve comparable energy savings you have to rely on the memory in your head rather than having one in the machine. Since higher humidity usually occurs while you are at home, showering, cooking, even breathing, it's not rocket science. Only you can decide whether this refinement is worth the extra outlay. If not, the Ebac Amazon dehumidifier may be the one for you. The Ebac Amazon dehumidifier will extract either 12 or 15 litres of water per day, but please don't expect it to pull that much from the air in your home. Extraction rates, quoted by all manufacturers, are measured at high temperatures and humidity levels when more water can be extracted and are for comparative purposes only. That is to say they indicate which dehumidifier extracts the most water or is the most "powerful". Typically you can expect to be emptying the water container twice a day and it is very unlikely to fill to capacity and stop the machine within 12 hours. If bought direct from the company the Ebac Amazon dehumidifier comes with a free one year warranty. If purchased from a third party supplier warranty conditions may differ and any claims against the warranty must be made with the supplier, not Ebac. 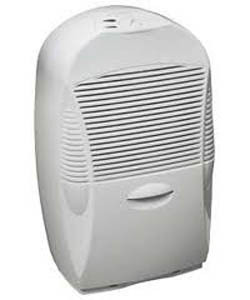 The main attractions of the Ebac Amazon dehumidifier are that it is made in the UK by a company with a reputation for quality. It is a basic machine but effective doing the job for which it was designed, well made with repair facilities, if needed, comparatively close. The adjustable humidistat is an advantage because it ensures the machine does not run wastefully so long as relative humidity is below your pre-set level. It is also important not to reduce relative humidity too much as this can also cause damage to home contents and make living conditions uncomfortable for people. Above all this machine is a relatively inexpensive machine to buy. There are cheaper brands available, mostly made overseas, and the usual balance must be struck by the purchaser between the probability of a longer life time of a slightly more expensive, well made appliance compared with its cheaper rivals. There are no obvious disadvantages with this dehumidifier. Provided its limitations are understood and taken account of it should do its job.